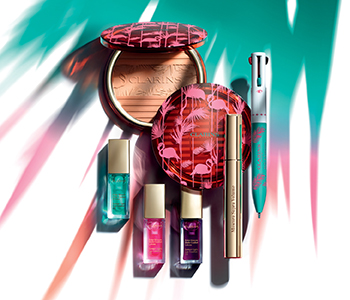 Drench your skin in the vibrant hues of the Clarins Sunkissed Summer Colour Collection, a tropical mix of cool and warm shades inspired by the sunny coastline of Florida. Your summer makeup look awaits with this limited edition collection of must-have beauty, a range of fresh colour that’s so perfect for the season. From a ready-to-wear bronzer right through to colourful and juicy lip selection, the sundrenched Sunkissed collection from Clarins will be your go-to throughout the summer.